Small, rounded shrub with purple leaves. 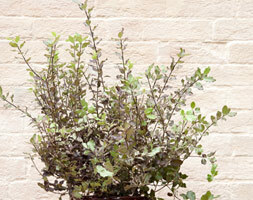 This compact, evergreen shrub has a small, wavy, dark purple leaves and striking, dark grey or black young stems. With its distinctive rounded shape, and pretty leaves, it will give all-year foliage interest in a pot or sunny, well-drained mixed border. This one has been potted up into a glazed terracotta pot, so it is ready to place on the patio. If planting in the garden, try it as a punctuation point in a gravel garden, or with strappy Phormiums for formal contrast. While it sometimes produces honey-scented, dark purple flowers in late spring and early summer, it&apos;s not a reliable flowerer. Protect from cold, drying winds.